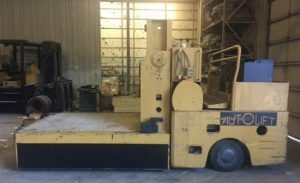 Die handlers and carriers can save a ton of hassle in the plant. Often times, forklifts simply can’t get into tights spots or handle the load of a large die. Of course, dropping a die and damaging it really isn’t good idea. The cost can be outrageous for repair and down time. On the flip side of the equation, the cost of a new die truck can be prohibitive. You’re controller might gag a little when he sees the price. Because of that, a lot of plants look for a used or second hand handler or burden carrier. Even huge fortune 500 companies recognize the cost savings and buy used. Die handlers come in basically two ways. With arms to “grab” the die or without. The ones without are really more of motorized carts or burden carriers. Also, some will raise up and down and others may have a fixed height. Power can be from electric motors or propane engine. Capacities range from 20,000lbs to 200,000lbs. The bigger the capacity, the bigger the cost of course. One consideration to think about with the electric version is the battery life. I don’t mean how long a charge last, but how old the battery is. New batteries can cost many thousands of dollars to replace. So, you would do well to check that out. An alternative is a die cart. They are simply heavy duty carts that can be pulled by a forklift or plant tug. However, they won’t grab a die and rarely will the have height adjustments. What are common die handler capacities: 20000lb, 30000lb, 40000lb, 50000lb, 60000lb, 80000lb, 100000lb, 120000lb, 150000lb, 200000lb. If you happen to find any that constitute the larger sizes and that’s what you need, then you won’t want to wait. There simply aren’t that many to be had and it could bet bought out before you make your decision.